The Highway Safety Team is based at County Hall in Hertford. The team contribute to the Highways Service objective of delivering Safe, Reliable Journeys, Sustainably. The team comprises of the Head of Profession Robert Surridge, Senior Engineers Linda Irons and Alan Lusted, Engineer Martin Sears and Chris Ripley Apprentice Technician. Road Safety Auditing, this involves specialist engineers undertaking reviews of the safety implications to road users of highway designs and implemented projects. Safety issues are identified and the team make recommendations to mitigate the safety issues. Collision Investigation and Collision Reduction Projects, this includes investigating personal injury collisions that have occurred on our roads and the resulting engineering projects are aimed at addressing, where possible, any patterns that have been identified. Working within the Hertfordshire Safety Camera Partnership, the team are responsible for the maintenance and ensuring that the safety cameras within Hertfordshire remain operational. The Highway Safety Team are not responsible for immediate/urgent faults on the highway, these can be reported via our fault reporting page Highway Fault Reporting System. The main purpose of the team’s role is to reduce the frequency and severity of personal injury collisions that have happened on the network and assist in preventing them from happening by giving guidance to designers on the safest designs possible. Our roads deal with 4.5 million journeys every day, in contrast to this there are on average 3500 people injured on these journeys on an annual basis. Over the last 10 year period the team have seen this number decrease, but they aren’t content with this and aim to continually improve on this record. 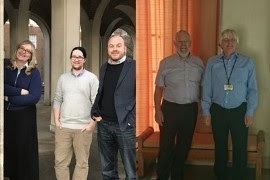 The team has recently been bought back together following a structure change; four members of the team have actually been working together for the last 15 years. The role doesn’t change significantly during the different seasons, the only real challenge comes when the Highway Safety Team undertake night time site visits and those long summer evenings make for some late finishes. One of the funniest moments in the teams memories is when on their way to attend a site meeting, a flock of sheep decided that the main road was the place to be, sheep herding then became the task of the day! The team works as part of the Road Safety Partnership, who undertake a wide number of initiatives currently a campaign is being run to encourage drivers not to use their mobile phones when behind the wheel #putitaway.